Another cycle to work, another stop at the Marine Lake. The tide is not so favourable today, I can see it's way out so there probably won't be much there but I'll check anyway. 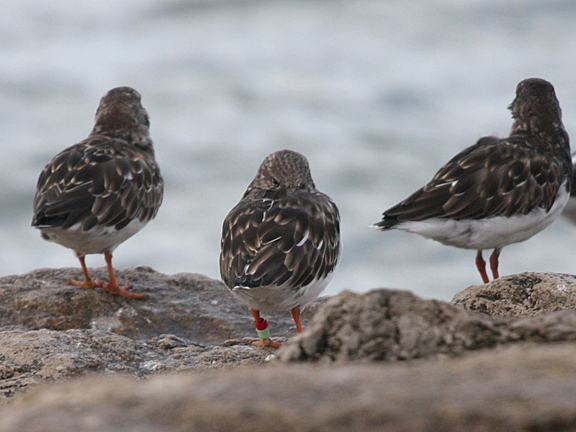 A handful of Turnstones are roosting on the armour stone but the Redshank, Knot and Dunlin of the previous days are still busy piping the mudflats for food. Looking closely I see two are colour-ringed, notes are made and photos taken. I turn my attention to the water of the lake, I wonder if yesterday's Merganser is still around or if it has been joined by another. A few sweeps with the binos and no sign. 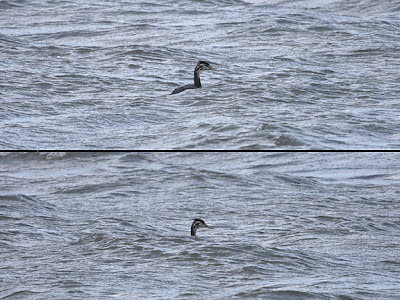 It seems it has been replaced by a juvenile Great-crested Grebe. It's very choppy today so it's tricky to keep it in view. It keeps disappearing behind waves inbetween the dives it is making. Lots of short dives close together, so I figure it's found a shoal of small fish. When it does show, between waves, the patchy black markings that give away it's adolesence are easy to see. Zooming along the Wirral Way on my Super Deluxe I have yesterday's wish granted. 2 Redwing flash from the hedgerow across the path in front of me and into some tall Poplar trees that are swishing in the breeze. 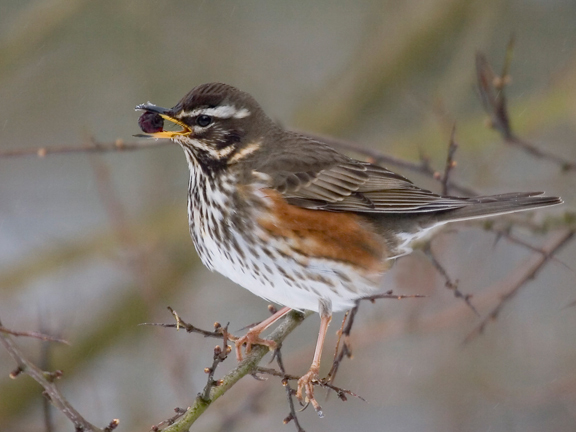 No sign of the Fieldfare flock today, but I'm made up with the duo of winter thrushes. As I carry on along the track a startled female Pheasant bolts from the cover of the Hawthorns and flees Warner Bros. Road Runner style along the path with me in inadvertant pursuit a la Wile E. Coyote. Thankfully my brief role as Road Runner's arch enemy doesn't end with an anvil dropping on my head from the sky or me pedalling off a cliff. Instead I arrive at work rather chuffed with a diamond ride in - ready for anything!